Join the vultures soaring above the plains of Pilanesburg National park. 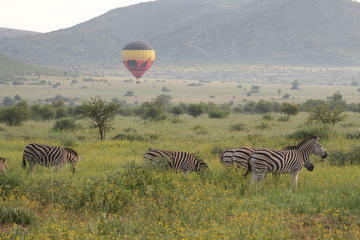 Experience this natural wonderland from a hot air balloon, spying game as far as the eye can see. With a chance to see the big five while enjoying a champagne breakfast, this is truly an amazing opportunity. Your day will start with an early morning hotel pickup. Your informative local guide will transport you to our takeoff location. Day visitors are collected from the Bakubung Gate. Here you will listen to a quick briefing, before hopping into the basket for your aerial adventure. You will be in the air for around 45 minutes, providing you with the perfect vantage point to spot game and enjoy the spectacular sights below. This really is a unique opportunity to appreciate the African Plains below. It is not often one is able to view this serene natural landscape from such an angle. Upon landing, you are greeted with champagne and orange juice, before being whisked away to the private lodge. There you are treated to a full English breakfast. Such a great experience. From so high, the African savannah is incredibly vast, expanding as far as the eye can see. Its also weirdly peaceful up there. Would definitely suggest this to anyone.